Preheat the oven to 290°F. 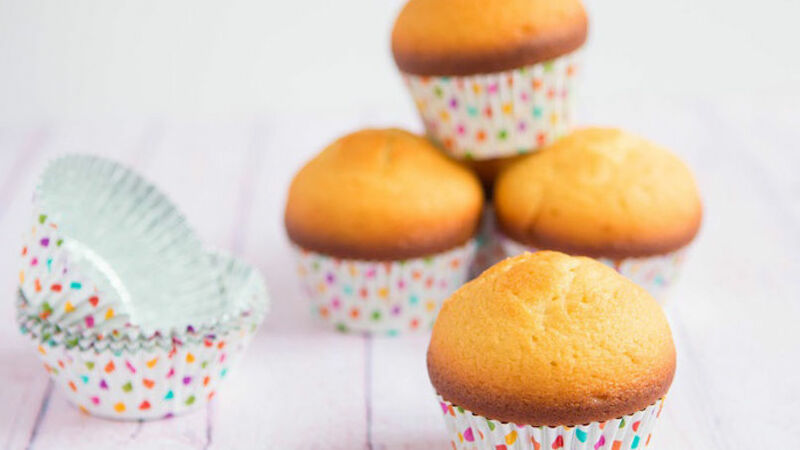 Place a paper cupcake mold in each of the muffin molds. Set aside. Mix the baking powder, flour, and salt in a large bowl. Set aside. Use a blender at medium speed to mix the eggs and sugar for 5-8 minutes or until it doubles in size. Add the milk and continue blending until all the ingredients are well incorporated. Add the oil little by little. Reduce the speed and add the flour mixture one cup at a time and continue blending until everything is well combined. Add the lemon zest and mix for 1 minute. Fill the molds to the brim with the help of an ice cream scoop. Sprinkle with a bit of sugar if you like and bake for 15-20 minutes, or until a toothpick comes out clean after poking the pastry. Let cool on a rack and serve. You can use 1/2 teaspoon of lemon extract instead of lemon zest. Use sunflower oil instead of olive oil if you like. Magdalenas are Spain's version of our famous cupcakes. The truth is that they are really delicious! They have a subtle taste of lemon and are quite spongy. One of the main differences between magdalenas and cupcakes is that the former are pointy at the top. We should use extra large cupcake molds to allow for the magdalenas to expand properly while they bake. They're so delicious that they're perfect for any occasion, so start baking and surprise your family!